Add the remaining 1 Tbs. oil, carrots and onions to the pan. Season with 1/2 tsp. salt. Cook, stirring and scraping up any browned bits on the bottom of the pan, until the aromatics are soft and lightly browned, 6 to 8 minutes. Addthe chopped dried figs, ginger, garlic, star anise, and cinnamon sticks, and cook, stirring, until well distributed and fragrant, about 1 minute. Pour 1/2 cup of the red wine into the pot and cook, stirring to scrape up any browned bits on the bottom of the pot, until the liquid is reduced to about 2 Tbs., about 1 minute. Transfer all the ribs (and any juices that have accumulated) back into the pot. Pour the tomatoes, chicken broth, soy sauce, remaining 1/2 cup of red wine, and 1 cup water over the ribs and using tongs, arrange the ribs as evenly as possible and no more than two layers deep. 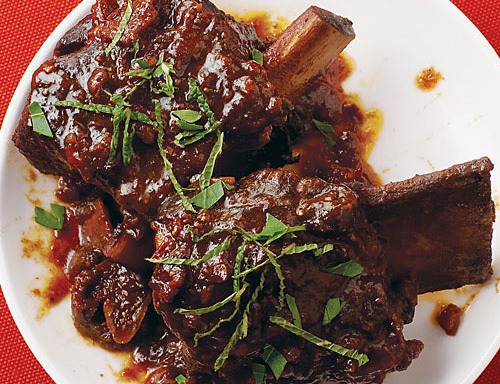 Serve the ribs with the sauce spooned over, sprinkled with chopped parsley and chopped mint.